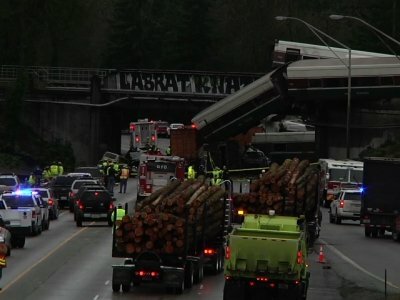 DUPONT, Wash. (AP) — An Amtrak train making the first-ever run along a faster new route hurtled off an overpass south of Seattle on Monday and spilled some of its cars onto the highway below, killing at least three people, injuring dozens and crushing two vehicles, authorities said. Attention quickly turned to the train’s speed. Federal investigators say the train was traveling at 80 mph (129 kph) in a 30 mph (48 kph) zone. Bella Dinh-Zarr, an NTSB board member, said at a Monday night news conference that information from the event data recorder in the rear locomotive provided information about the train’s speed. She said federal investigators will likely be on scene for a week or more. There were 80 passengers and five on-duty crew on board when the train derailed and pulled 13 cars off the tracks. Authorities said there were three confirmed deaths. More than 70 people were taken for medical care — including 10 with serious injuries. About two hours after the accident, a U.S. official who was briefed on the investigation said he was told at least six people were killed. The official said he had no new information to explain the discrepancy in the numbers. A track chart prepared by the Washington State Department of Transportation shows the maximum speed drops from 79 mph (127 kph) to 30 mph for passenger trains just before the tracks curve to cross Interstate 5, which is where the train went off the tracks. Kimberly Reason with Sound Transit, the Seattle-area transit agency that owns the tracks, confirmed to the AP that the speed limit at the point where the train derailed is 30 mph (48 kph). Speed signs are posted 2 miles (3 km) before the speed zone changes and just before the speed zone approaching the curve, she said. Bob Chipkevich, a former NTSB director of railroad, pipeline and hazardous materials investigations, told The Seattle Times the crash looked like a high-speed derailment based on television images. Emma Shafer was headed home to Vancouver, Washington, on winter break from the Cornish College of the Arts in Seattle and was napping when the crash occurred. She awoke to find her body at a 45-degree angle and her train car dangling from the overpass. Someone behind her was pinned by the legs, she said, and she and others who could walk exited the train by crawling onto a car underneath theirs that had been crushed. “It felt oddly silent after the actual crashing. There was a lot of metal, a lot of screeching, a lot of being thrown around. It was very quiet. Then there was people screaming,” Shafer said. He called it a miracle an infant child he saw from the scene appeared completely unharmed. The new bypass was built on an existing inland rail line that runs along Interstate 5 from Tacoma to DuPont, near where Train 501 derailed. Track testing began in January and February in advance of Monday’s launch and continued through at least July, according to the Washington State Department of Transportation. The mayor of Lakewood, Washington, a city along the new route, predicted a deadly crash — but one involving a fast-moving train hitting a car or pedestrian at a grade-crossing, not a train tumbling off an overpass. This story has been updated to reflect that authorities said Monday night that three people died. A U.S. official said earlier that six people were killed. It has also been updated to correct the spelling of Emma Shafer’s name. Flaccus reported from Portland and Sisak reported from Philadelphia. Associated Press staffers Manuel Valdes in Dupont, Sally Ho and Phuong Le in Seattle and Michael Balsamo in Los Angeles contributed to this report.